Mangaluru, May 14, 2015 : The Congress Government in the state which came to power with a promise to strengthen the Panchayatraj system and also to delegate more power to the people in order to work towards the overall development of rural areas, has now gone back on its words and has disappointed the people, alleged Mangaluru North Zone BJP President and former minister J Krishna Palemar. Speaking to reporters here on May 13, Wednesday, he said the Panchayats presently do not even have the authority to grant house construction licences, issue door numbers as well as sanction power connections. The proposal to get approval from three different engineers even for construction of thatched roof or mud walled house by the poor is nothing but ridiculous, Palemar said and charged the government of exploiting the poor. Continuing his tirade, Palemar said the Rs 40 lakhs provided to Mangaluru North Assembly constituency for rural drinking water facility has not been fully utilised and alleged that water has not been procured from even a single bore well which has been drilled. “The release of just 15 per cent funds under Namma Grama-Namma Raste project which envisages construction of 20 km long road in every assembly constituency limits, also reveals the inefficiency of the Government,” Palemar further added. “Though the government has been claiming that it was offering 30 kg rice at Re 1 per kg, the same has now reduced to 16 kgs. Even this may stop once the GP elections are over,” Palemar said. He also urged the people to give a befitting reply to the government during the upcoming Gram Panchayat elections. 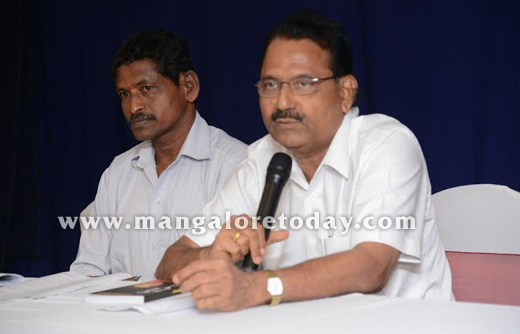 Zilla Panchayat Member Janardhan Gowda and others were present at the press meet.